Most people would prefer to stay out of a coffin for as long as possible, but for devotees at the Looi Im Si temple, in Penang, Malaysia, sleeping in a coffin is the best thing that could happen to them. The Taoist temple located in Jelutong worships deities linked to the afterlife, like Xiao Xian Bo, one of the two guards responsible for bringing the dead to the other side. Chu Soon Lock, the temple’s secretary, claims his grandmother founded the temple after receiving instructions in a dream, from hell deity Di Fu Bao Zhang. 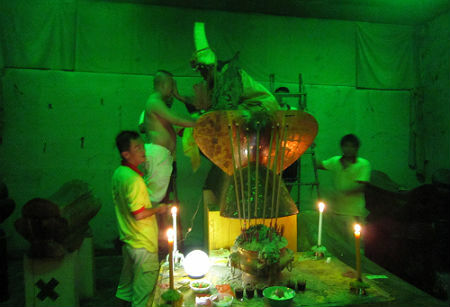 As the years went by the temple started worshiping various other deities like Ji Gong, Si Da Jin Gang and Mile Buddha. 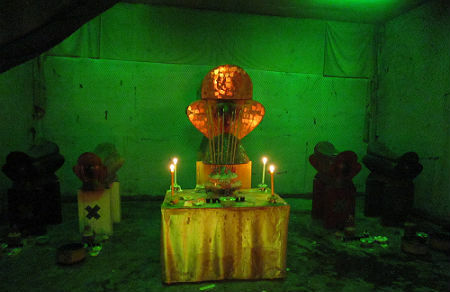 The weirdest part of the story of Looi Im Si temple started in 2007, when the spirit of Xiao Xian Bo arrived at the holy place and began addressing his devotees through the body of Chu Soon Lock’s brother. Chu Soon Chye says he doesn’t know a word of Teochew, yet he speaks the dialect fluently each time he is possessed by Xiao Xian Bo. Back in 2008, when he was in a trance, Soon Chye instructed temple devotees to place five coffins within the temple, and only allow people with serious problems caused by bad luck to sleep in them. Only one of the five coffins is used, because the other four are apparently too small to fit into. Bad luck sufferers who slept in the “good luck coffin” say it made all the difference in the world. “My stomach was very uncomfortable and I had breathing difficulties while sleeping but the doctors could not find the problems. After sleeping in the coffin, my problems were gone,” said 31-year-old Lim S.C. who has been sleeping in the coffin regularly for a few years. The bad luck removing ritual is fairly simple: the affected person lies down in the coffin, is covered up to their neck with a holy cloth, and the spirit of Xiao Xian Bo recites some prayers through the possessed devotee. Lying down in coffins seems to be pretty popular these days, especially in Asia, where Thais have a similar procession that makes worshipers feel reborn, and in Taiwan where students are buried alive by their teacher.